King George V can be seen in his top hat in the centre of the stand. Queen Mary is standing to the right holding her folded parasol. 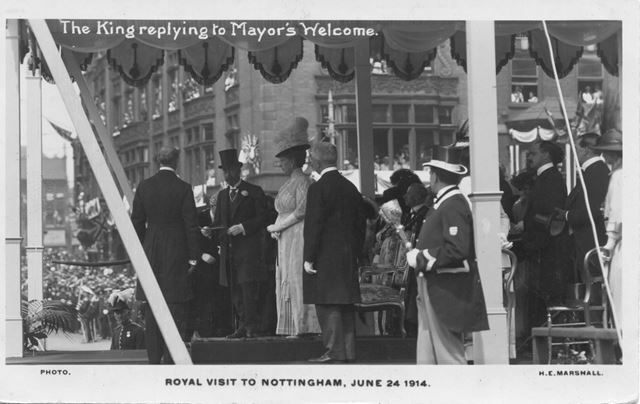 The King and Queen seem to have be on a Royal Progress tour of Nottinghamshire for a few days. On the 24th June (the day they are seen here) they also visited a factory in Nottingham's Lace Market. They then visited Hucknall Mansfield and Shirebrook on the 25th June. On the 26th of June they visited Retford ( all of these pictures can be seen on this web-site). The Retford pictures show the King looking very tired (and it should be remembered that these visits were only a few weeks before the outbreak of World War 1). King George V (1910-36 AD) was born June 3, 1865, the second son of Edward VII and Alexandra. His early education was somewhat insignificant as compared to that of the heir apparent, his older brother Albert. George chose the career of professional naval officer and served competently until Albert died in 1892, upon which George assumed the role of the heir apparent. He married Mary of Teck (affectionately called May) in 1893, who bore him four sons and one daughter. He died the year after his silver jubilee after a series of debilitating attacks of bronchitis, on January 20, 1936.